Olinda is named after Olinda Creek, which begins in the township. The creek was named in 1858 after Alice Olinda Hodgkinson, the daughter of Clement Hodgkinson, Victoria's acting Surveyor General. The town was initially a logging settlement, however as land was made available for horticulture in the early 1900s, the town began to grow substantially. The Post Office opened on 21 August 1901. Berry farming, dairying, and flower growing became prosperous industries, and tourism soon flourished as the principal industry of Olinda. In 1919 the Australian artist Sir Arthur Streeton returned to Australia and built a house on the property called Longacres, in Olinda. Olinda is home to cafes, restaurants, antique and craft shops, and numerous art galleries, showcasing local, national, and international artists in such areas as sculpture and painting. It has a public swimming pool, a primary school, and is home to the National Rhododendron Garden and the Olinda State Forest. The Ashendene Boys Home was located in Olinda. Together with its neighbouring township Ferny Creek Olinda has an Australian Rules football and netball teams (Olinda-Ferny Creek) competing in the Yarra Valley Mountain District Football League. Olinda also has a cricket club boasting 5 junior teams from non-competitive to under 16s, 4 senior sides and a veterans team. In past four years the cricket club has won a total of 8 premierships. Olinda receives all Melbourne TV and Radio Channels, as it is very close to the Transmission towers, which are West of Olinda. However, being near the Transmitters and in the hills, Olinda also receives channels from Gippsland, and some from Bendigo. 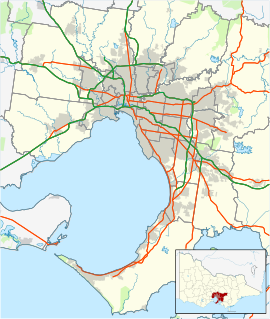 TV operators are ABC, SBS, Seven Network (Melbourne), Nine Network (Melbourne), Ten Network (Melbourne), Southern Cross Nine (Gippsland and Bendigo), Prime7 (Gippsland and Bendigo), WIN Network (Gippsland and Bendigo), 7TWO (Melbourne, Gippsland, Bendigo), 7mate (Melbourne, Gippsland, Bendigo). ^ Australian Bureau of Statistics (25 October 2007). "Olinda (State Suburb)". 2006 Census QuickStats. Retrieved 1 October 2007.